I'm starting a new thread for this. This is the high poly captain that will be used to generate normal maps for the low poly version that was modelled by Orl. Bowman is skinned and in-game. First person hands and the bow are also done. After a few touch-ups, he will be completely DONE. Huscarl is modelled, unskinned, and in-game. Right now he's running around without textures. Still need to finish high-poly version for the normals. 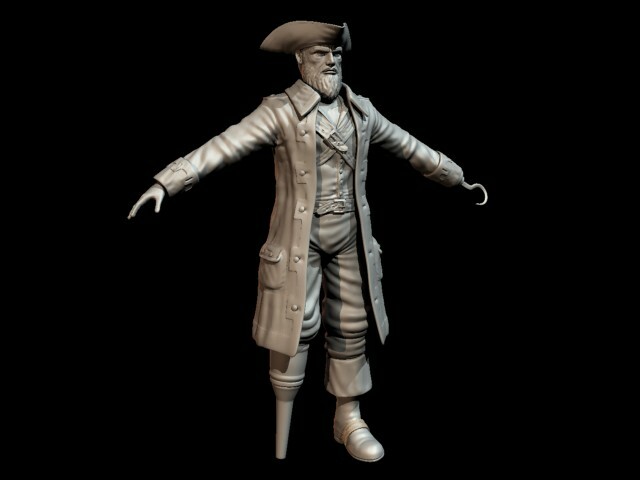 Captain is modelled, unskinned, and will be in-game soon. Things are really quiet right now, but the progress isn't that bad if you consider it percent-wise. Arrr , It be lookin' good as a mug 'o grog! Also can't wait to see the Huscarl. My laptop just ran and hid under the bed just looking at the intricacies of that model. It was just a roadkill ghost. Nothing to worry about. We all go to Valhalla someday, let me save you the wait. 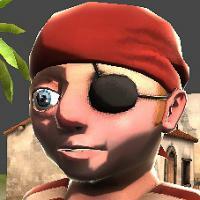 Captain better play an important role in the pirate team later on as the mod progresses, he looks too badass to be "just another pirate class". Huscarl is modelled, unskinned, and in-game. How does his axe compare to that of the Berzerker? Its the same thing for now. He also gets throwings axes and a sword n' board combo. Get PVK I and Grogbot (Google it). i rather play pvk2. i have the nasty habit of buying for example revenge of hottem 2 when revenge of hottom 1 is better. Started "normaling" the upper body, using a combination of uv match and raytrace projection methods. I have also made a static occlusion map that is baked into the color texture. I find it very useful in giving a model a softer shadowed look that is difficult to achieve by hand painting alone. I know from experience that it will need some editing as this will be a deforming character. Where there are shadows in one area, if the character deforms in a certain way, the shadowed area will be lit. Inbetween the legs is a good example of this. Robble robble. His beard looks a bit weird though. Yeah the crotch area looks like it would be a bit uncomfortable... as if he has a wedgie. Nice Necklace. I wanna see the parret. I'm looking forward to Huscarl most though, the poor vikings need some range. The parrot is already ingame. Heh, does it really appear? Yes, try it and see for youself. Awesome news, I cant wait for the next release to come out. "I Will See You In Valhalla"
Hehe, I just tried it 2 minutes ago, it looks good... And I think the damage is fine as it is, it's nothing overpowered.